• Summer Rayne Oakes is spoiling us with these really stylish frames and shades. The Eco and Eco by Summer Rayne Oakes collection are made with 95% recycled materials. Top it off with a video showcasing the collection featuring Moby's music. Get them HERE. • Iowa has become a state where it's illegal to tell the truth. 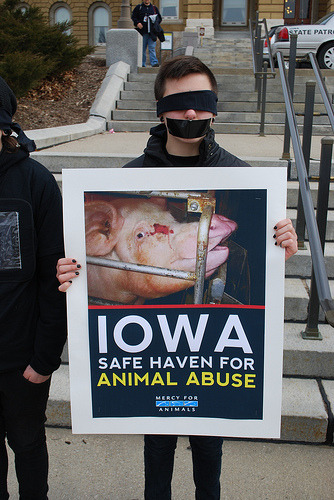 In a move that supports the illusions spun by big agricultural interests, Governor Terry Branstad has just signed the "Ag-Gag" bill that makes criminals out of undercover investigators and whistle-blowers who expose cruelty to animals, corporate corruption, dangerous working conditions, environmental violations, or food safety concerns at factory farms. Undercover investigations by Mercy For Animals and other groups have led to landmark corporate animal welfare policy reforms, new and improved laws to protect farmed animals and the environment, felony convictions of animal abusers, increased consumer protection and food safety initiatives, and the closure of particularly corrupt facilities. Without undercover investigations, there are oftentimes no effective watchdogs protecting animals from egregious cruelty in these facilities. Expose Factory Farm Cruelty - Please share this video with as many people as you can and help expose the cruel and corrupt practices of Iowa's factory farming industry. • Since the landing of US Airways flight 1549 in the Hudson in January of 2009, more than 3,200 resident Canada Geese have been slaughtered in the NYC area. The USDA killings are conducted in secret and without any community notification or public approval. This summer, members of GooseWatch will attempt to meet USDA on the scene of the Canada go ose "round ups" that occur in public parks, in order to document the cruel operations. When we kill animals that inconvenience us we create and perpetuate intolerance for all life, including fellow humans. Only a very small percentage of habitat that once existed in NYC for migratory birds still remains. Can’t a huge city of more than 8 million people live with a few hundred avian residents?